My whole family loves smoothies but I have one family member that does not like bananas. I created this recipe for him, but you will never miss the banana. 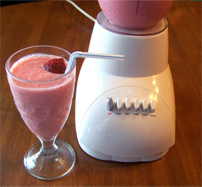 Place all ingredients into blender and blend on highest speed until smooth. Makes 24 ounces or enough for 3 – 8 oz servings.